"This decorative, tasty bread looks like a bird's nest when finished. Use raw eggs that you've colored to put in the center. They cook right along with the bread! This is a favorite in my family, and we have it for breakfast every Easter Sunday with the eggs we've colored. This Easter bread is especially tasty because it has a faint hint of lemon in it. My favorite way to eat it is warmed up, with butter spread on top." Sprinkle yeast onto warm water in a mixing bowl; let stand 5 minutes. Stir in 2 tablespoons sugar and 1 1/2 cups flour until smooth, then cover and set aside in a warm place until doubled in bulk, about 1 hour. Cream together the shortening, 1 cup of sugar, and salt in a bowl. Add the 2 eggs and egg white, one at a time, mixing until smooth between each addition. Stir in the yeast mixture along with the lemon zest, lemon juice, and remaining 3 1/4 cups flour until a smooth dough is formed. When the dough has pulled together, turn it out onto a lightly floured surface and knead until smooth and elastic, about 8 minutes. Deflate the dough and turn it out onto a lightly floured surface. Divide the dough into four equal size rounds; cover and let rest for 2 minutes. Roll each round into a long rope about 18 inches long. Grease two large baking sheets. Using the two long pieces of dough, form a loosely braided ring on one of the baking sheets, leaving spaces for three colored eggs. Seal the ends of the ring together and use your fingers to slide the eggs between the braids of dough. Repeat to form second loaf. Cover, and let rise until doubled in bulk , or until your finger leaves a dent when the bread is gently pressed, about 30 minutes. Preheat oven to 350 degrees F (175 degrees C). Beat egg yolk together with 1 tablespoon heavy cream; set aside. Bake in preheated oven for 10 minutes, then brush on egg yolk mixture and decorate with candy sprinkles. Continue to bake until the loaves are dark brown and sound hollow when tapped on the bottom, 30 to 40 minutes. 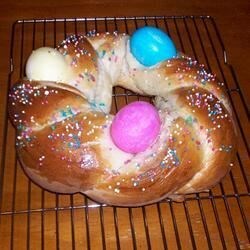 Round, braided Easter bread decorated with natural or dyed eggs. I probably wouldn't have attempted this had I known the rise time would differ so substantially from those stated in the recipe. I also recommend keeping a very close eye on timing during baking. Delicious and very pretty. I used orange peel/orange juice instead of the lemon. For some reason, my bread needed extra rising time, but it turned out great (eventually).